Do I have to ride all the way? No. Actually, only about 70% of the participants cover the entire 2,448 miles. The rest join up or drop off along the route. Some people have made the event over more than one year - covering different segments each year. We salute them as our 'Repeat Offenders' and give them a special pin. Are the ride dates for one way or both ways? How much does it cost to make the run? "An estimate would be about $150 per day for meals, lodging, gas, and incidentals." Who will lead the ride? The RallyMaster will serve as a professional guide with over 14 years touring RT66. The Rally organizers designate headquarters motels and alternates. Each participant has a daily Itinerary with the route information and is not held hostage. Participants can ride at their own pace-- join up and drop off when they please -- making for their own personal tour of Route 66, while still enjoying the company of other 66 cruisers. Each year has seen Repeat Offenders, people who have made the trip before. They have distinctive pins and are always ready to share their expertise with a "newbie." While riding this Route 66 Motorcycle Tours. Can I sign up at the 'join up' points or on the day of departure? No. You must be registered in advance. Does Ride Rt 66, LLC make lodging and meal arrangements for the event? We will designate 'headquarters' motels (La Quinta, Quality Inn, etc) in cities along the route. Participants can then make reservations at those motels in advance, attempt 'day of arrival' accommodations or make other arrangements. Meals are a matter of individual arrangement... there are usually restaurants near the motel. Does Ride Rt 66, LLC help people to meet other riders? We designate 'join up' points along the route. There is a get-acquainted, pre-departure dinner the night before the start of the Rally. Also, registered riders are given a 'Buddy-up' list of all the participants, for this Route 66 Motorcycle Tours. Participants should arrange individually for a 'rescue' service... motorcycle specific. If the breakdown can't be fixed in 15 minutes, the Rally rolls on. We do not provide a 'sweep' vehicle with spare parts/bikes, towing/loading/repair capability. What sort of weather should we plan on? In Illinois, Missouri and Kansas expect cool mornings with a high in the 80's. Rain is a possibility. From Oklahoma City westward expect hot, dry and windy. Where, exactly, are the 'join up' points? That information is sent to registered participants, for this Route 66 Motorcycle Tours. Yes. Just return the registration materials to our office. An option is to roll-over your registration to next years rally. A roll-over is allowed one time, and if not used that next year, no refund is given. Are there other Route 66 materials you recommend? Our videos/DVD's include documentaries of previous Rally runs. They will give you an excellent preview of what you will see. Ghost Town Press has a separate map for each of the 8 states Route 66 passed through. Those 8 maps are offered to all participants. Additionally, major 'chain' bookstores stock Route 66 materials. Why don't I find a highway 66 on the maps I see? 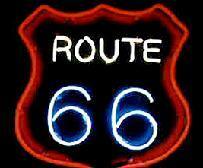 Route 66 - as far as the national highway system is concerned - ceased to exist in 1985. That's when the Interstate System was complete and Route 66 was decertified. Route 166 can be found in Kansas. State Route 66 exists in Oklahoma between the Missouri border and Oklahoma City. There it is known as the 'free road,' because the Interstate is a toll road. How far is it between gas stations on Route 66? There are only two segments of the old road where gas is a concern. The first is between Seligman and Kingman, AZ and the second is between Needles and Barstow, CA. Both are 85 miles in length. Gas on those legs is uncertain and it will not be a major national brand. We suggest that a person always leave Barstow, Needles, Kingman and Seligman with a full tank of gas. Everywhere else gas is plentiful for this Route 66 Motorcycle Tours. Does it cost more if I have a passenger? Yes, there is a $35 passenger fee. Yes, You may E-mail us @ rally@rideRT66.com. Phone: 352-684-5293 List is below. SHIPPING ALL ORDERS OUT OF COUNTRY CALL OR E-MAIL FOR A PRICE. A separate map for each of the eight states that Route 66 passed through. Created by Mother Road experts Jerry McClanahan and Jim Ross. The maps provide an easy to follow through route and clear, simple directions to keep you on the right track as you take the historic journey down America's legendary highway. You'll find tips on locating abandoned segments. The maps are an absolute must for Route 66 cruisers. Here is your personal DVD scrapbook of the Mother Road Rally. See your friends, catch the interviews and highlights. Re-live the adventure! CLICK THE BUY NOW BUTTON BELOW. THESE ARE WHITE LONG SLEEVE WITH RT-66 LOGO ON SLEEVE WITH FLAMES. FRONT SAYS MOTHER ROAD RIDE RALLY WITH RT-66 LOGO. BACK HAS MRRR LOGO PICTURE OF THE EIGHT STATES WE RIDE IN WITH MILEAGE.CONTACT: E-MAIL GEORGE@RIDERT66.COM. PHONE 352-684-5293. WHEN ORDERING PLEASE ADD ON PAYPAL "INSTRUCTIONS FROM BUYER" IS THIS FOR MAN'S SHIRT OR WOMAN'S SHIRT & SIZE. . THANK YOU.